Guitarist Eugene Edwards sparkled all night, not just because of his bedazzled tuxedo jacket. His scorching riffs made the Telecaster seemed extra twangy while the three other members helped prove why they are considered one of the best touring bands in country music. Yoakam does not play lead but is no slouch on acoustic, deftly chicken pickin’ his way through intros to “Liar” and “Things Change.” Mitch Marine seemed to heed John Bonham’s timeless advice: “If you want to sound like me, just hit ‘em harder” as his tom tom work boomed throughout unconstrained by a drum baffler .The set featured select tracks from the recently released “Second Hand Heart” which hearkens back to Yoakam’s major label days with Warner Bros. /Reprise and a host of hits from his 21 album catalog. 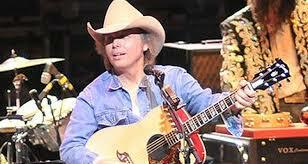 There were few demarcation lines between songs as Yoakam delivered hits in a stream of consciousness staccato fashion. Canadian Colter Wall’s menacing baritone was well suited for the material from his inaugural EP, “Imaginary Appalachia” which includes a murder ballad and a hobo anthem.